Idealy located close the plaza Urquinaona in the Eixample District, this elegant decorated apartment can welcome up to four people. Ideal to visit barcelona, you are within short reach to several famous museums, churches and monuments in the old city of Barcelona. Moreover, in Urquinaona, there is two metro lines which bring you directly to Barcelona's beaches or the Plaza Espanya (with the Palau Nacional, the Olympic Stadium,...). 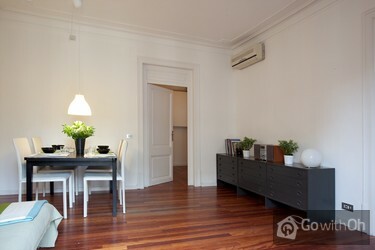 This one bedroom apartment of 52m² is very well furnished with all the equipments to have a nice stay. In the bedroom there are two single beds and a sofa bed in the living room offers space for two more people The kitchen has all the equipments you will need and the bathroom comes with a shower. Exterior oriented, there is natural light in the flat and you can enjoy the view over the street from the balcony at the third floor (with lift of this well conserved building). The landlord can also offer a baby chair and cot for a baby up to 3 years. Hot water heater is small--Took \"Navy showers\" to be able to rinse with hot waters, e.g., wet down, water off, lather up, rinse off, done. Even after that, had little for a hot water shave. Nice, clean, quiet apartment, in very good location. Somewhat minor but....Small capacity of water heater meant that there was insufficient hot water , even for two people. Shower rose loose, and prevented a comfortable shower. Everything was perfect except the noisy place. People emptying their glass trash at 1am, Emptying trash-trucks working from 11pm to 2am every 2 days. Was a pleasure to meet Queralt. I wish her all the best for this new way of living. An excellent apartment, modern, clean and spacious- would love to live somewhere like this! 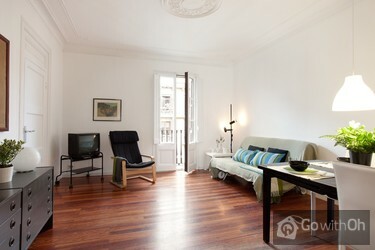 Ideal location just a short walk from Las Ramblas and a major metro station. Despite being close to all the action the road the apartment is situated on is very peaceful. It was difficult dragging a heavy ...suitcase up five flights of stairs but we were warned about the lack of lift. Queralt the landlady was very friendly. A great 5 days! Flat was very nice and as described. First night were were in doubt of the quietness because on the street just below there is a re-cycling place for glass, plastic, paper etc and people kept throwing glass bottles and other trash into the bin all night. The windows are not designed to keep any ...noises out so light sleepers might be bothered. Also on weekends there is traffic noise. The apartment and location were perfect in every way. It was well equipped with every thing we needed, including a washing machine. Queralt was very helpful and provided every assistance to us. On a eu une semaine magique à Barcelone. Queralt est simplement adorable!! Elle nous a accueilli comme si on faisait partie de sa famille. L'appartement est exactement comme sur le site. Pendant la période plus froide il faut absolument allumer le chauffage du salon, mais à part ça, on peut ...avoir un séjour de rêve. C'est ça Barcelone c'est beau commme un rêve!! 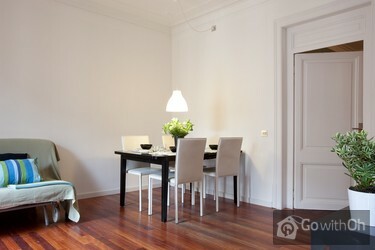 Excellent and quiet location, close to Metro and Placa Catalunya, with easy access to city sights. Light, comfortable, simply furnished apartment, with thoughtful attention to detail. Contact flexible and helpful with excellent English. Recommended. Das Appartement war sehr schön. Ruhig, zentral gelegen, vom Flughafen sehr gut zu erreichen. Kontaktperson sehr freundlich und hilfsbereit. Sehr zentral, 5min zur Rambla ,schöne saubere Wohnung,sehr nette, hilfsbereite Kontaktperson;Lärmpegel für eine Stadt wie Barcelona war ok.Ein supermarkt ist gleich um die Ecke, ein Zeitungskiosk gleich vor der Haustür. Wir haben uns sehr wohl gefühlt und kommen mit Sichrheit wieder. Super Stadt!!!!! Fantastic apartment and location. If it was for sale, I'd buy it. Very helpful landlady. Would gladly book it again and recommend it to anyone who would like to go to Barcelona. Apartment was as advertised, extremely clean and location was great. A/C was welcomed in the 30-37 degree days. Stairs became tedious after a few days, but we were warned. The tourist info in the apartment was helpful. Queralt, our contact person was helpful and friendly. The apartment was nicely decorated, spacious, and immaculate. Great to have air-con. At night we shut the window shutters and it was very quiet. 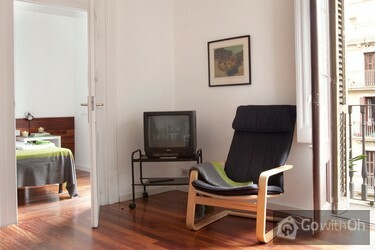 Handy location (7 min walk to La Rambla). Queralt, the landlord, was awesome (cannot say enough)! Yes there are a few stairs but over-all you could not ask for a better set-up. Spacious. Worked out very well for our two kids and us. Great location too! Just 4-5 blocks from Las Ramblas. Would definitely stay there again. Die Lage ist sehr gut. Alles konnten wir zu fuss erreichen. Das Apartment ist sehr sauber und ist super ausgestattet (Bügeleisen, Bügelbrett, Waschmaschine, Handtücher, etc.). Ist nur kleiner wie es am Foto aussieht aber wir haben dort wirklich nur geschlafen. Empfelen kann ich es jungeren ...Leuten, da es kein Aufzug gibt. Ruhige lage und ein paar Meter von Palau de la Musica entfernt sowie von 2 Supermärkten. Wonderful simple, clean apartment with very friendly and helpful contact person. 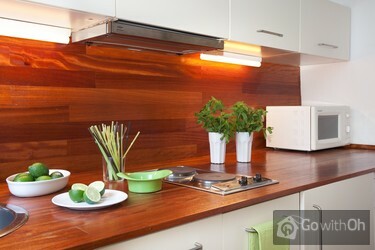 The apartment was very centrally located, clean and in an attractive neighborhood. All of our expectations were exceeded. The owner was very friendly and extremely helpful. The appartment was in an excellent location, close enough to everything but in a quite street to escape from the hustle and bustle of Barcelona after a hectic day. The contact person was very friendly and spoke good english. The decoration and style of the appartment were excelent. The only downside... was when i stayed in January the weather in Barcelona was extremly cold which made the flat very cold and ideally could of done with more heaters. The contact person did provide an extra heater which helped despite this i enjoyed staying at the appartment and will definately book it again. a comfortable and very well apponted flat and spotlessly clean. It was a fair old trek up the stairs (around 80) but the quality was worth it. The contact for renting the flat was very helpful and spoke very good english. The accommodation was exactly as the pictures explained, and Queralt Gelpí the landlord was fantastic. She was there when I arrived, arrived on time the day I left (which was very early in the morning!!!) and even gave me a lift to my bus stop! My friends who also were in Barcelona were very ...impressed, and are more than likely to use the accommodation again. We enjoyed our stay in this newly refurbished apartment and found the warm, friendly welcome of the owner a pleasant introduction to Spain. The apartment, which is in a central location near the old town, was neatly furnished and well presented. The flat was well equipped, in an excellent location and very attractive. We stayed in August and we were quite hot especially at night, despite the fan provided. My only suggestion for the flat would be a small air conditioning unit. 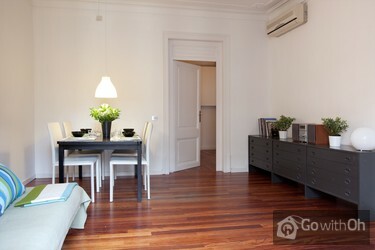 Very confortable flat, near la Rambla. Inside the flat you can find many books and guides to Barcelona. Owners are very kind. Suggested. Appartement agréable, décoré avec gout, très bien situé et très bien équipé. Well and nicely equipped apartment, excellent location close to Barcelona's attractions, excellent public traffic communication. High street noise level. Very nice and helpful hosts! An excellent apartment, nicely furnished and well equipped, clean, spacious, bright, quiet, 2-minute walk from Urquinaona Metro station and 7-minute walk from Plaça Catalunya (where the Aerobus stops and a big supermarket is located). It has a great book collection on Barcelona from art, ...architecture to the latest trendy spots (also Spanish-English dictionary and phrase book). Queralt and her father were very helpful. Highly recommended! la sistemazione era buona sia come appartamento che come posizione.I disagi sono stati per le scale (erano 4 piani e non 3) e per la biancheria da letto (non c'erano coperte del peso adeguato al periodo o troppo leggere o piumoni troppo pesanti). No one said anything about the constant and very noisy bucket lorries, starting at 11.30 through until dawn! As a consequence we didn't get one decent nights sleep (very quiet where we live so a big contrast)so for that reason very glad not to stay longer. Lift kommt erst im Herbst sonst aber super!!! Easy, straightforward reservations. Nice sunny studio. Clean, great residential neighborhood across the street from a metro and walking distance to Las Rambles. This was my second time in the flat, and I plan on reserving it again next year. Ansprechend und zweckmäßig eingerichtete, sehr zentral gelegene Wohnung - leider ohne Aufzug (4. Etage). Wir waren schon zweimal dort und würden jeder Zeit wieder hin fahren! Die Fotos stellten die Wohnung in einem besseren Licht dar, als sie tatsächlich war. Die Wohnung befand sich außerdem in der 5. und nicht in der 3. Etage, was mit Kindern und Kinderwagen Erschwernisse bedeutete. Die Ausstattung war ok, Sauberkeit nicht herausragend. Das Bad war baulich sehr ...enttäuschend. Lage super, nur nicht leise. Die Kontaktperson war sehr nett und zuverlässig. A+ Nous avons apprécié notre séjour. Viva Barcelona! l'alloggio era bellissimo e confortevole.siamo stati benissimo e barcellona è troppo bella!!! Very good quality/price accomodation. It will be better, when the lift installation will be finished. Waterheater capacity is not enough for 3 persons. Appartamento in posizione centrale, ideale per muoversi praticamente sempre a piedi. 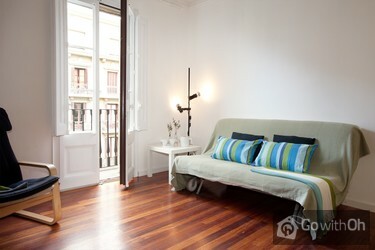 Great accommodation in the center of Barcelona. It was our 4th time in this appartement and we will definitely book it again! The landlord is very friendly and helpful. La cama no era muy comoda y el elevador no estaba habilitado, por lo que subir el equipaje los 4 pisos no estuvo muy bueno. El piso muy lindo, agradable, centrico y la ubicacion muy buena. tutto eccellente, un po' freddo, doccia scomoda. Je tiens à signaler que nous avons été très satisfaits de l'appartement loué à Barcelone. Sa situation en ville est idéale, sa taille très correcte pour 4 adultes et l'accueil charmant. Perfectly located small apartment. Very pleasant landlady. Appartement très bien situé, quartier accueillant, dans une ville dynamique et riche en curiosités: bref , un excellent séjour que nous souhaitons à tous! Sehr laut, aber super zentral. a 5 minuti a piedi da piazza catalunya,se avete il sonno leggero farete un pò di fatica ad addormentrvi....mancano le lenzuola e la cucina è adatta x 2 persone (piccolo il lavandino x lavare i piatti e solo 2 fornelli elettrici dove 2 pentole normali assieme non ci stanno.attenti ...all\'ascensore:gioca brutti scherzi!in una settimana si è rotto 2 volte anche se prontamente riparato,avrei potuto esserci io nell\'ascensore!a parte queste piccolezze tutto perfetto:c\'è anche un eccelente store dove fare la spesa e prendere croissant e boccadillos a prezzi ottimi! Great location, great apartment in the city centre close to all attractions. The apartment was modern, clean and the contact person was very helpful and friendly. Would reccommend to all. Die Wohnung lag sehr zentral, aber der Lärm von der Baustelle vor dem Schlafzimmerfenster war unerträglich. The travel kettle provided was a nuisance and it wasn\'t even automatic. There were no cups or mugs provided. Could do with another easy chair. Also another lightweight blanket. Bathroom fine and plenty of hot water. Beds ok. The books were interesting. Apartment was spacious and the lift always worked. Très bien Dommage qu'il n'y ait pas d'internet mais effectivement ce n'était pas précisé. Gemütliches modernes Appartment in super Lage! - está muy bien situado en Barcelona - la calle no está demasiado rudioso (para una ciudad española) - tiene todo lo que se necesita - las personas de contacto muy amables - para personas con mucho equipaje: hay un ascensor! Good location, clean well equipped apartment (although kettle was unusable, hair dryer was an ornament and showering was tricky) friendly owners (although hard to contact with numbers provided). We had only a problem with the hair drier, who didn't work. Die Wohnung liegt sehr zentral zur Altstadt und Anbindung an Metro. Sehr nette Kontaktperson. Apartamento muy confortable, tranquilo y cómodo. Con una ubicación muy buena. La persona de contacto, excelente. Wash machine door is extremely difficult to open. Bedroom bulb dead. No mirror in bedroom. Shower equipment lying in the tub, so had be be held by hand. Bedroom pillows too thick and pillow cases too small. Apartment clean, but insects were sighted at the ground floor entrance. Super freundlich und hilfreich. Kommunikation in Englisch problemlos sowohl via Telefon als auch per Email. In general we were very happy with the apartment, which was just as described on line. The location was perfect for us: central and near to lots of things without being in the thick of tourists and noise. Our only disappointment was that the clothes washer was broken when we arrived, and since we ...stayed 10 days, that was an inconvenience. The contact person for the apartment was charming and very helpful. Zeer goed gelegen appartement, ruim en proper. Rustige en mooie omgeving. oh-barcelona.com Goede opvolging van de boeking en overzichtelijke website. La verdad que fue todo estupendo, el trato, la ubicación del apartamento y lo comodo que era. Le doy las gracias. Personne très sympathique et accomodante. Location as well as the service and the appartment were very good. We missed only a bigger electric watercooker to prepare the tea. The accommodation was great. Clean and quite adequate for a week in a foreign city. It accommodates 4, which could be a wee bit tight, but we were three and it was perfect. What I really liked was the fact there was toilet paper, washing up liquid, washing machine powder, olive oil, vinegar, salt & ...pepper etc in this apartment. Whether it's deliberate, or the result of things left by previous tennants, I don't know, but it is very useful to have this on hand and not to have to go shopping. I had dragged the basics with me from a house we stayed in in south of France, so had come prepared, but if you are not prepared, then it is great to have all these things and not to have to go and buy the essentials and only use a little. So I would recommend that the owners continue to ensure that these things are present as it is a great help. The location of the flat was excellent, but it was quite noisy, especially at night. We went to bed early, and the locals party till the wee hours, so we heard them during the night and early morning). Having said that, we did sleep with our window/doors open, and these would help shut out the noise if you found it unbearable. The owners were charming and helpful and all in all I would definitely recommend this as a place to stay. Regarding to Oh-Barcelona, great service. Günstige Lage am Rand der Altstadt, gute Ausstattung, freundlicher Vermieter. Sehr empfehlenswert! Appartment was clean. Beds good. Simply chairs and bathroom etc. Building very old. Excellent apartment, great location, and very helpful people when we locked our keys in!! Many thanks! Le propriétaire va prendre toutes les mesures nécessaires pour assurer la propreté de son appartement. L'appartamento ha tutto quello che dice la descrizione, ma le rifiniture non sono ottimali e non viene dato pulitissimo. In ogni caso è ottimo considerando il prezzo. Posizione davvero incredibile. Il servizio è ottimo, la persona di contatto davvero squisita, gentile e disponibile. Die Unterkunft an sich hat uns sehr gut gefallen. Es war nur ein wenig schade, dass wir erst am späten Nachmittag in die Wohnung konnten. Die Ausstattung der Wohnung war zwar nicht besonders hochwertig, dafür war aber die Lage optimal. Sehr nett war auch die Kontaktperson. Alles wie beschrieben (nur der Fernseher macht es wohl nicht mehr lange...), wir waren sehr zufrieden! Description précise et conforme à l'appartement. L'appartement a été remis à neuf en réponse aux remarques (salle de bain). Appartement conforme à la description et très bien situé, proche du centre! Propriétaire très agréable et disponible. 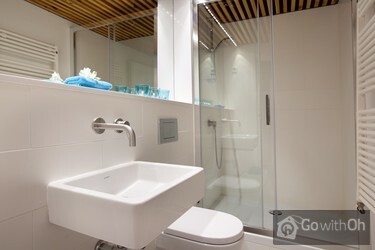 A beautiful apartment with a new bathroom, centrally located. Landlord was very nice. X. es un excelente anfitrión, el lugar es tal como aparece en las fotos, cuenta con todo lo que necesitas para pasar cómodamente unos días en Barcelona y la ubicación es inmejorable. Está muy cerca del metro y de supermercados para abastecer la despensa. Vayan con toda confianza. sehr schönes sauberes und geräumiges Appatement. Gut ausgestattete Küche und ein sauberes greäumiges Bad, bei dem sogar die Dusche perfekt funktioniert. Wir konnten alle Aktivitäten bequem von der Wohnung aus unternehmen. Das Appartement liegt ideal zentral 2 Minuten von der Metro entfernt. ...Gleich bei der Metro gibt es eine tolle Focacceria mit guten Nudeln. Einziger Nachteil des Appartements - die Lage ist extrem laut. Die Müllabfuhr kommt in der Regel zwischen 2 und 3 Uhr jede Nacht (!) und macht einen Höllenlärm. Auch der Verkehr ist sehr zu hören. Ansonsten aber uneingeschränkt zu empfehlen. Wohnungsübergabe problemlose. Herr G. ist sehr freundlich. Klimaanlage funktioniert gut. Waren zu zweit von 12/06 bis 18/06. Das Appartment ist wirklich schön und sehr gut gelegen - wir legten so ziemlich alles zu Fuß zurück. Der Vermieter konnte zwar kaum Englisch war aber sehr bemüht (früherer Check-In als geplant und auch die Abreise wurde nach hinten verschoben). Alles in Allem sehr zu empfehlen. 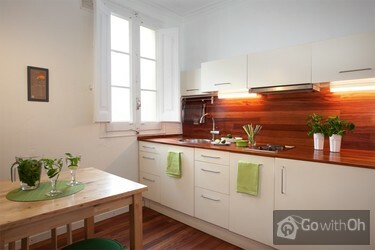 The location is easy 5-min walk to Catalunya and Ramblas. Supermarket is close by. The apartment gets noisy when windows are opened due to the traffic that is normal in that area. 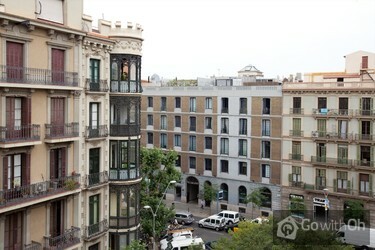 Super séjour car appartement en plein centre situé près de tout à pied :superette, métro, bus, ville gothique, place catalunia, ramblas...Propriétaire très sympa.Appart avec toutes les commodités. A refaire sans hésitation. Idéalement situé dans un quartier sécuritaire de la magnifique ville de Barcelone, l'appartement est beau, vaste et propre (salle de bain récemment rénovée). La proximité de la station de métro Urquinaona et de différents commerces, tel un supermarché, a été très appréciable. Les ...commodités du logement étaient en excellent état, mais les lits sont peu confortables. Le confort des locataires pourrait être amélioré à moindre coût en installant des surmatelas. La personne de contact (X.) a été très gentil, même s'il était un peu difficile de se comprendre (je ne parle pas espagnol et lui parle très peu le français et l'anglais). En somme, j'ai beaucoup aimé mon séjour dans cet appartement. Je n'hésiterais pas à le recommander ou à y retourner! Advise them to keep both the kitchen window and the front windows open to create a breeze. Also, you need to get some pegs for the washing line. 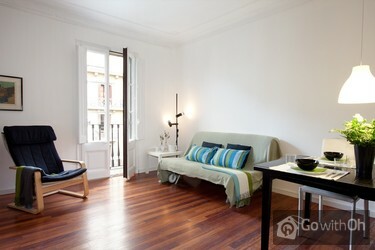 Great location - 12 mins walk to Ramblas, beside a supermarket and metro. A pity there was no oven and a bigger kettle would have been nice (us Irish like our tea!). Overall, a no brainer - stay here! C'est un très bel appartement qui est très bien situé. Nous avons visité en marchant mais il est possible de prendre le métro qui est tout près. Il a fait chaud mais l'air climatisé de l'appartement était efficace. Malgré tous mes efforts, je n'ai trouvé qu'un supermarché ( ouvert ...jusqu'à 2 heures) et l'autre qui semblait plus complet; je ne l'ai pas vu. L'appartement est très propre, plein de charme. Tout près de la gare de Sants ( en taxi, 12 euros) et près de la place Catalunya où nous pouvons prendre les bus ( aussi les bus pour l'aéroport. Nous sommes à 5 minutes de la Rambla... Bref un beau séjour. Le propriétaire parle peu l'anglais et le français...un peu difficile. Tres bel appartement climatise au coeur de Barcelone. Proprietaire tres agreable , parlant meme quelques mots de Francais. Appartement idéalement situé pour un séjour sans voiture. Bus, métro, train à proximité. Au coeur et à proximité de tous les quartiers et sites à visiter. Un accueil et un sens du service très appréciable. A l'abri des nuisances citadines et festives. Changer les fenêtres pour une ...meilleure isolation thermique et phonique serait un "plus" appréciable. Bonne literie, fonctionnel pour le petit-déjeuner mais peut-être un manque d'équipement pour les repas principaux et puis, pas de lave-vaisselle pour les vacances incite à manger au restaurant... logement très propre à notre arrivée. Very nice apartment. Large, clean, big closets. 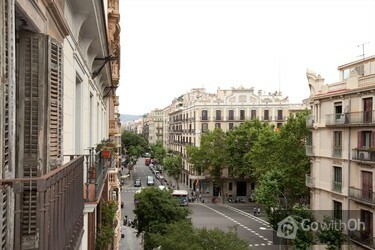 Close to metro, placa Catalunya and Passeig de Gracia. Nice little market around the corner. Kind and helpful owner. Would stay there again. I enjoyed my staying in this accomodation very much. It's 5 minutes away from Plaza de Catalunya - so very convenient if you come to the centre of the city with the bus from the airport. Everything is very clean, the kitchen is fully equipped with all you need to make a meal, some tea and coffee are... also there. There are even a couple of city guides if you don't have your own one. The contact with the contact person was also nice and easy. I will definitely book this accomodation next time I am in Barcelona and will also recommend it to my friends. Sehr gute Lage , sehr sauber! Besizer der Wohnung sehr nett, wartete schon draußen , als wir mit dem Taxi ankamen.Empfehlungswert!! !Immer wieder gerne . Danke auch für die kompetente Beratung sowie sofortige beantwortung auf gestellete Fragen. Große, helle Wohnung in bester Lage. Die Vermieter waren ausgesprochen entgegenkommend und gastfreundlich. Ich kann die Wohnung jedem empfehlen der überlegt ein paar Tage in Barcelona zu bleiben. Une bonne adresse à recommander. L'appartement est très bien situé, à quelques minutes de marche de differents centres d'intérêt, une ligne de métro toute proche. L'appartement en lui-même est très propre et confortable. Manque juste un four. Très agréable accueil du propriétaire,disponible et arrangeant. Hervorragende Lage,Aufzug im Haus,gut eingerichtetes und zweckmäßiges Appartement. Bonjour. Le propriétaire est charmant mais ne parle pas du tout Français. L'appartement est propre, bien situé pour y accéder de l'aéroport (et inverse) et visiter la majorité des sites à pied. Sinon, une station de métro se trouve à 200 mètres. Pour ceux qui veulent manger à ...l'appartement, une supérette à 100 mètres et tout ce qu'il faut dans la cuisine (à part un four). Avec tout cela, de quoi passer un excellent séjour à Barcelone où nous retournerons sans hésitation à cette adresse. 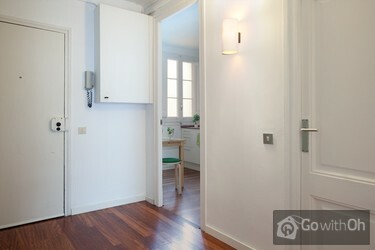 Appartement très bien situé pour visiter Barcelone (proche du centre historique) .Spacieux , bien équipé , proche de commerces (supérette) et du métro. Mériterait un double vitrage pour atténuer le bruit pendant la nuit. Appartement bien situé pour visiter Barcelone . Commerces à proximité. L'appartamento è centralissimo, ma il proprietario dovrebbe ristrutturare le imposte dei balconi che sono vecchie, non si chiudono bene, e si sentono i rumori esterni. Il pavimento in parquet scricchiola un po', non c'è completamente copertura Wi-Fi e il letto è molto scomodo in quanto si sentono... le molle; i materassi quindi dovrebbero essere sostituiti. Per quanto riguarda la cucina e il bagno c'è l'indispensabile. Mancano delle coperte un po' più leggere per il letto, e l'appartamento potrebbe essere pulito meglio. Considerando il prezzo, con questi aggiustamenti, l'appartamento potrebbe essere perfetto. L'appartamento ha bisogno di manutenzione ( le porte, il pavimento). L'essere vicino al centro da' la possibilità di raggiungere i punti di maggiore interesse facilmente. L'appartamento sarebbe ottimo con la sistemazione del parquet oltremodo sconnesso e rumoroso. Appartement spacieux pour une famille de 4. Situation idéale pour visiter la ville. L'appartement est grand et fonctionnel, il est très bien situé, à deux pas du palais de la musique.par contre il est entre deux rues très passantes et donc bruyant, il faut fermer les fenêtres pour être au calme. il est situé au dernier étage et nous n'avons jamais entendu les voisins.Cet ...appartement est ouvert aux fumeurs, nous le savions mais n'étant pas fumeuse, il m'a été difficile de m'asseoir dans le canapé qui était imprégné de l'odeur, surtout le plaid, de même pour les enveloppes de matelas. il serait bien de les laver entre chaque location.le propriétaire est très gentil. votre site recommande le bus 46 pour se rendre de l'aéroport au centre de Barcelone mais contrairement à ce que vous dites, ce bus ne s'arrête pas plaça catalunya lorsqu'on vient de l'aéroport, son terminus est plaça di spagna, c'est à 25 mn à pied de la plaça de catalunya.vous pourriez aussi parler des consignes de bagages qui sont carrer de l'estruc, à côté de la plaça catalunya, nous l'avons su en allant à l'office de tourisme mais c'est une information intéressante lorsque vous devez rendre l'appartement à 11h et que votre vol est bien plus tard. El sofá cama estaba muy sucio, manchas clarísimas.El aire acondicionado funcionaba con muchísimo ruido, era insoportable.El radiador del baño no funcionaba.La placa para cocinar muy lenta y parte del menaje estaba sucio al llegar.Ropa de cama escasa sin sabanas para el posible uso del sofá cama... y toallas escasas.En general habría que dar un repaso al piso, paredes sucias, la relación precio/calidad no se corresponde, es muy caro. Location is just perfect. 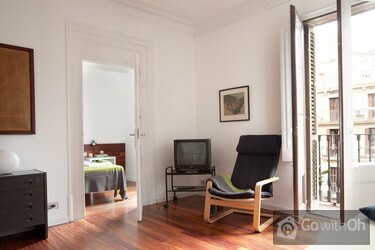 Everything is in a walking distance, just a few minutes walk from placa catalunya. Only the floor at the apartment was pretty old and noisy. Great apartment, owner was helpful and speaks English which made it easier. Excellent location, made it easy to get around. Highly recommendable. The apartment had everything in it that we needed and was very clean. The owner let us in and saw us out at the times we preferred 2.30 p.m. arrival and 11 a.m. departure. The apartment was convenient for all the tourist attractions we wanted to see as it was about 10 minute walk from Placa de ...Catalunya and The Ramblas and it was also only about a 10 minute walk to the beach which we weren't interested in as we wanted to see the sights but would be great for people who wanted to do both. Although it was near to everything it was a quiet location so we slept well! We would certainly recommend it to our friends and hope to go again next year. A great location, with good amenities. Owner was very nice and met us right on time. Appartement très agréable, idéalement situé, bien équipé.Seul petit bémol: le bruit de la circulation nocturne si on ouvre les fenêtres. Location is very central, really enough space for two adults and baby. Apartement is on top floor (4th floor above grade) of a house with some 10 flats (partly residential, partly business). House built around 1900, new lift. Practical IKEA furniture and kitchen, nicely renovated bathroom. Clean. ...Contact person spoke very limited English, was very friendly and check-in and check-out worked very smoothely. Earlier comments complained about noise when walking on the wood floor - yes you can hear it in some spots but it is like many wood floors... Earlier comments complained about street noise - yes you can hear the streets and there is traffic, even waste disposal trucks in the late evening but it is not excessive, there was no loud party folks and you are in the center of a lively town! Die Wohnung ist etwas verwohnt aber sauber und für einen Ferienaufenthalt ausreichend. Sehr gute Lage, nur 2-3 Minuten Richtung Altstadt. Nur vor dem Haus stehen die Mülltonnen, die leider sehr laut gelehrt werden. Der Kontakt hat einwandfrei geklappt, die Kontaktperson war sehr freundlich und pünktlich. Die Wohnung selbst könnte ein wenig überholt werden, sie ist ein wenig ...abgewohnt und zum Beispiel der Wasserkocher war mit Leukoplast abgeklebt und müsste dringend ersetzt werden. Location is great and it is a comfortable place. The only issue we had is that there is a lot of street noise. Also would have preferred to use a credit card for the entire transaction. Very nice appartement - highly recommended!Very good contact to host, handling of paying and appartement-handover very uncomplicated, appartement is equipped with towels, bedclothes and many other necessary things. We'll book again on our next stay at Barcelona!Very good situated near Placa de ...Catalunya (5 minutes walk), cheap and very good bakery just around the corner (open daily from 6 to 22). The apartment is well situated in a quiet area, yet easy walking distance to may attractions. Check in and out was easy and they accommodated us with an early check in, after an overnight flight. 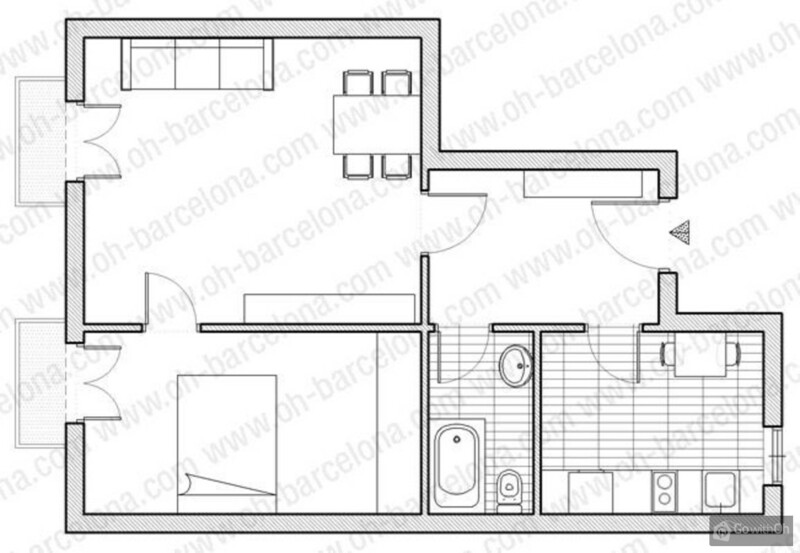 Flat is good size with a separate kitchen area. The apartment could use updating. The floors are warped ...and somewhat difficult to walk on. Furniture is older "IKEA style". If fit our needs as we didn't expect higher end, but some might be disappointed. Appartement topissime (propre, confortable et bien situé) et accueil sympathique. On reviendra vite. Great location close to metro, grocery stores, etc. Washing machine with clothesline was handy (although only 2 clothespins provided). Air conditioning was not overly effective. It was HOT during this stay; we had to move all beds into the main room as that was the only one that cooled slightly. ...IKEA furniture made for challenging sleeping conditions.Owner very accommodating. Despite his limited spoken English (although great via email) and my limited Catalonian, we were able to communicate. The apartament is in a very good location. 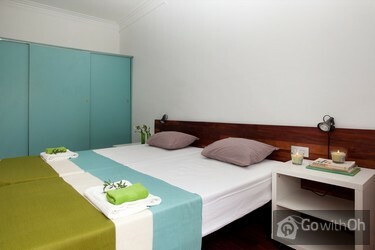 It is simple, but quite spacious and it has all the basic equipments one could need during the stay. My only suggestion is to change the washing machine for a wash an dry one. The owner and his son are really nice and we had no problem. Immeuble dans une rue relativement calme sans nuisance la nuit. Métro Urquinaona à l'angle de la rue et direct pour le parking Viajeros. L'appartement est parfait pour visiter à pied le quartier gothique et autres. A notre demande, la literie de la chambre à été changée pour des ...matelas très confortables le mardi suivant notre arrivée. Le propriétaire est très réactif et agréable de contact. Un petit book avec les adresses utiles autour de l'appartement et les heures d'ouverture serait le bienvenu. Nous renouvellerons notre séjour à cette adresse. Giedereen locatie.Alles bij de hand zoals supermarkten, metro, bars.Het appartement was niet zo schoon. De kleine koelkast was binnenin beschadigd en het deurtje van de freezer kapot, dus, geen freezer om te gebruiken. L'emplacement de l'appartement est vraiment idéal permettant de se déplacer à pied vers les principaux centres dintérêt de la villeL'appartement est très bien équipé et confortable Une location à recommander ! Todo excelente!! El tamaño y estado del departamento, la atención del propietario y su padre. Ninguna queja, todo lo contrario, totalmente agradecido!! !